AP Primary Schools English Teacher's Module/Hand Book: AP Primary Schools English Teachers Module has been released by APSCERT, English Hand Book for Primary School Teachers, My world in English (i to v) eBook, online audio materials, Teachers hand book, A teacher's companion, AP primary schools English teachers Module/hand book. 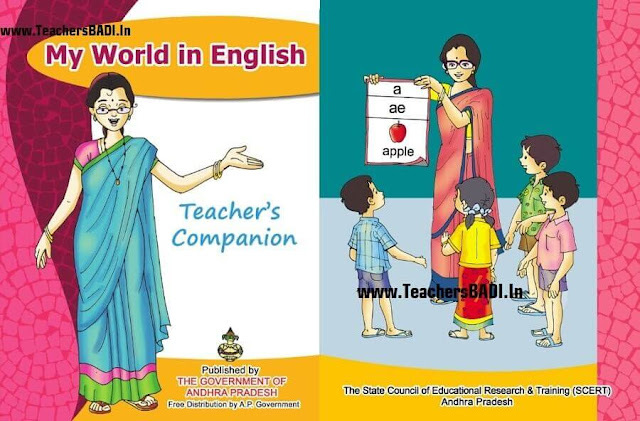 The Government of Andhra Pradesh has successfully brought out a new set of textbooks - My World in English (I to V), taking into consideration the requirement of the learners and the pedagogical demands of the subject. The well planned textbooks have been richly supported by audio materials available online. These materials will be of great help to our elementary school children to develop interest in the new language and achieve their goal of learning it well. This book, a companion, is going to assist the teacher's classroom activity of guiding the pupils in the areas of pronunciation, punctuation and grammar. The Government and the faculty associated with these materials have done their bit and now it is the turn of the teachers to help the learners acquire adequate command of English. A teacher's companion is a handbook meant to be used for reference while using other materials to teach a subject. This is exactly what this reference book is. It accompanies the five textbooks (I to V) of My World in English. As the title suggests, the children come to school with adequate awareness of the world. Now they just learn a new language to talk about it. In the process they also expand their awareness. The textbooks are supported by audio materials available online. These materials are made interesting and useful, so that the children tune themselves to the new language with enthusiasm. Wherever they have a doubt the teachers can refer to the phonetic transcription given in the companion. The companion uses Telugu and English for discussion because the teachers will be required to use Telugu in the classroom to describe and explain a few things. Pedagogical strategies and some lesson plans are given here only as suggestive models. Our teachers are very competent to develop their own strategies and work out their own plans. The teachers will find this small companion very useful in their journey of guiding tender minds through the furrows of a new language.